A new study from AAA reveals that some drivers using premium gasoline because it is recommended for use in their vehicles may be wasting their money. According to the research, premium gasoline offers some benefit to select vehicles that recommend or require it, but is becoming increasingly expensive for drivers across the U.S. In some areas, premium fuel is as much as 25 percent more per gallon than regular unleaded. 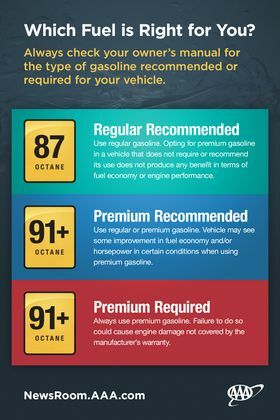 The new testing indicates that some vehicles – those that recommend, but do not require, premium gasoline – may see increased fuel economy and performance under certain driving conditions when using higher-octane premium gasoline. Unfortunately, the high cost of premium gasoline may outweigh that advantage for many drivers. As a result, AAA recommends drivers weigh the potential benefits against the cost of using premium gasoline, if their vehicle does not require it.